Check out the Mexican salad and chicken tacos that rival takeout. Food Network’s "Let’s Eat" host Jamika Pessoa is known for her bold flavors derived from her Caribbean roots. The Southern belle has traveled the country to highlight innovative dishes so it's safe to say she knows how to enjoy reinvented classics that are full of flavor. 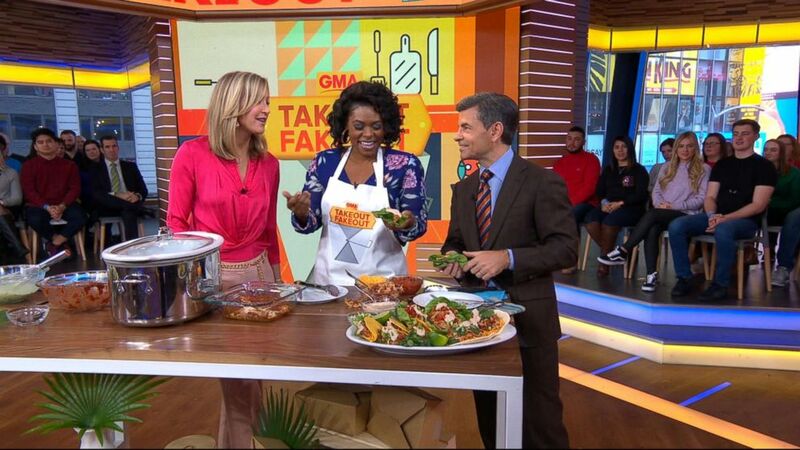 (ABC News) Food Network host Jamika Pessoa cooks two Mexican favorites on "GMA," Jan. 17, 2019. 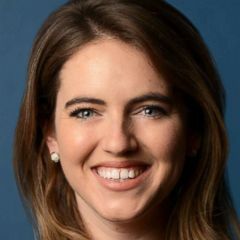 For our Takeout Fakeout series, where "GMA" challenges chefs to turn top takeout dishes into recipes you can make at home, Pessoa offered her spin on two Mexican food favorites. According to GrubHub, Mexican Caeser salad is one of the most ordered items for delivery in that cuisine. Check out her Caeser salad and chicken taco recipes below to bring some south of the border flavors to your own kitchen. (ABC News) Jamika Pessoa's Mexican Caeser salad as seen on "GMA." Pessoa said Greek yogurt is her secret to a creamy dressing with lower fat. She also substitutes pepitas, pumpkin seeds, for crutons! Preheat grill pan to high. In a small bowl, mix oil, chili powder, and garlic powder. Lightly brush both sides of romaine lettuce. Place lettuce cut side down on the grill for one to two minutes each side until grill marks are present. Remove from grill and set aside. In a bowl, combine black beans, corn, red bell pepper, and chili oil used previously on lettuce. Season with salt and pepper. Blend dressing ingredients together in a blender or food processor until smooth and creamy. 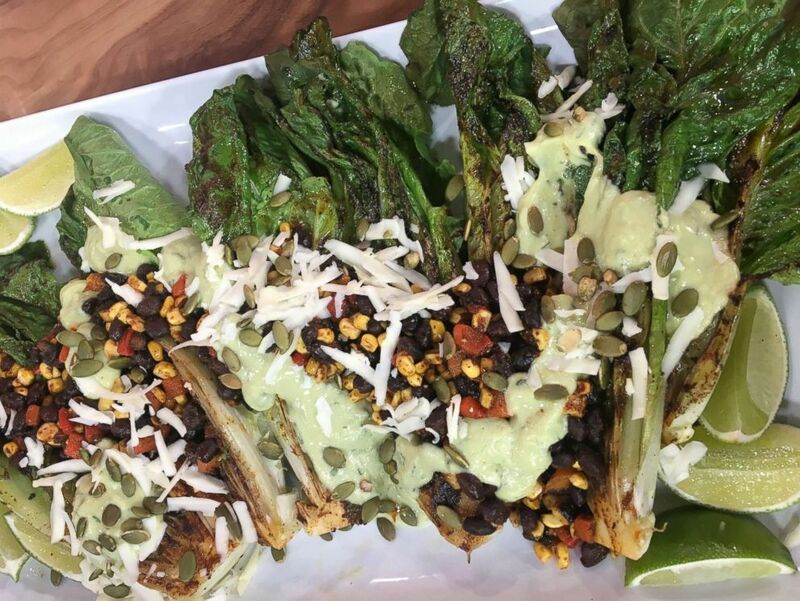 To assemble salad, place grilled romaine lettuce on a plate, spoon over vegetables, drizzle with dressing, and top with pepitas and crumbled cotija cheese. 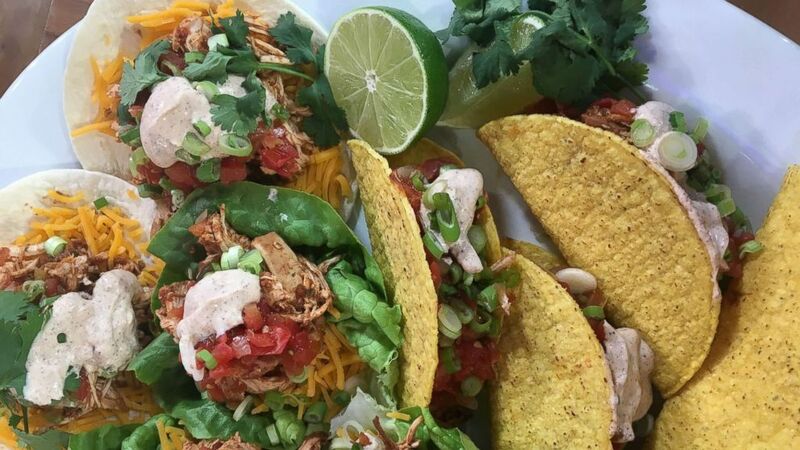 (ABC News) Jamika Pessoa's chicken tacos as seen on "GMA." Place chicken breast inside of slow cooker. In a small bowl, mix salsa, chili powder, garlic powder, paprika, cumin, salt and pepper. Pour salsa over chicken breast. Cover and cook chicken on high for 4 hours or on low for six to eight hours. Using two forks, shred chicken in the slow cooker and toss until salsa and chicken are well-mixed. In a small bowl, mix Greek yogurt, chili powder, garlic powder, salt and pepper, and lime juice. To assemble a taco, spoon shredded chicken into lettuce leaves (cups) and top with cheese, pico de gallo, green onions, and spoonful of yogurt. Enjoy!